Definition at line 39 of file engines.cpp. 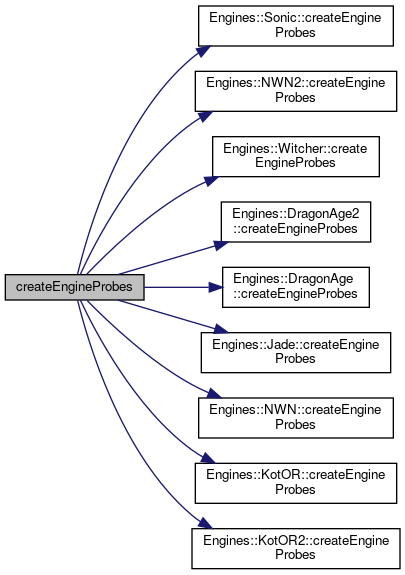 References Engines::Sonic::createEngineProbes(), Engines::NWN2::createEngineProbes(), Engines::Witcher::createEngineProbes(), Engines::DragonAge2::createEngineProbes(), Engines::DragonAge::createEngineProbes(), Engines::Jade::createEngineProbes(), Engines::NWN::createEngineProbes(), Engines::KotOR::createEngineProbes(), and Engines::KotOR2::createEngineProbes(). Definition at line 51 of file engines.cpp.